All children assembled in departments as instructed. Infant party numbered 24 children and 5 voluntary helpers under my supervision. We joined Juniors and Seniors in Junior playground and after prayers and hymns for God’s protection on all, we set out for Gateshead Station at 12.30pm, our destination Ushaw Moor. The source of this information is the ‘Tomorrow’s History Made In The North East site’. Do any of our elders recall an intake from Gateshead? Local school teams have had some significant success over the years, much of it noted by the Durham County Schools’ Football Association. The County Cup competition began in the 1908/09 season and was clearly very popular; it is reported that about 10,000 people attended the first final. A year later New Brancepeth School reached the final only to fall to Crook. A few seasons later New Brancepeth again got to the final but lost to Ryhope, however they made no mistake in the final of 19i6/17 when beating a school called Colliery from Sunderland. Bearpark School featured in two County Cup finals: 1926/27, losing to Eppleton, and 1929/30, losing to Chopwell. The Londonderry Cup is the most prestigious local cup competition and Waterhouses won it in 1918/19. Twenty years later Ushaw Moor School very nearly emulated them but lost in the final to Hookergate. 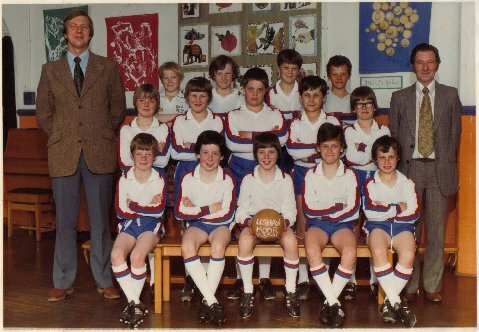 There is no mention of ‘RC’ so it was probably the Council School rather than Roman Catholic team. It is important that local football continues to receive support. Why not follow one or more of your local school, village and town teams? You might decide to continue following Newcastle or Sunderland but think what you could do with the money not spent on financially fattening up fit professional footballers; you could buy a new carpet or car or visit Australia. Or eat marshmallows in a bath at a Hilton hotel. I telephoned my half-sister Sheila Albone [as it was] today in order to catch up with family news. It turned out to be a fun call and full of information and good humour. 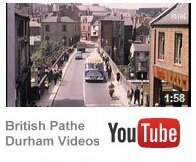 Obviously most of it was not about Ushaw Moor of old but some of it was! Sheila lived in Ushaw Moor during the period 1954 to 1960. She recalled some of her school friends of that time with great affection; Brenda Benson, Ann Stoddart and Cynthia. She got stuck on Cynthia’s surname so my brain delved into the memory bank and within two seconds up popped Beetlestone. Sure it might be Beatlestone, or a similiar spelling, but boy was Sheila impressed with my brain feat. Sheila explained that Cynthia spent some holidays with our family in a village called…something or other. Was it Newbiggin Sheila? ‘Yes it was’ said Sheila ‘how clever of you’. In passing Sheila talked about her brother, my half-brother, Colin Albone [b Ushaw Moor1954 died Stanley, Co. Durham 2002] and how he had coached the young Paul Collingwood at Shotley Bridge Cricket Club. Colin was the club’s professional at the time. Now I had not known that he had coached our great battler Collingwood – he of Ashes fame! So Cynthia Beetlestone: where are you now? For that matter where is Ann Stoddart and Brenda Benson? The mental reliving of the past requires as much honesty as we can muster but we will surely embellish our modest triumphs and distort and rationalise our disgraces. That is what we do and some of us are more adept at it than others; for some a past batting cameo becomes a match saving performance and for others the act of hanging out clothing on a windy day, in an efficient and technically correct manner, is given internal plaudits way beyond what can be reasonably justified. I imagine that there are many long standing marriages that survive only because a partner’s flirting with someone else failed to take off. I also imagine that railway ticket cheats went on to greater things by holding their nerve under the scrutiny of the unexpected ticket inspector. Oh and what about the undiscovered drivers that got away with driving fifty yards down the dual carriage way, the wrong way, in order to rectify a missed turning? We must be gentle with ourselves and chart a way forward that protects our self esteem and moral fibre. In so doing we must not be afraid of failure; an intelligent response to that is to welcome the learning experience and push on until the ceiling hurts the head. I have believed in his existence for years but I sometimes experienced a wave of doubt. Afterall, I asked myself, how can he visit so many houses in one night? That has never been answered to my satisfaction, but what do I know? This Christmas I got crafty: I placed some cotton thread across the inside of the lounge door [we do not have a chimney] and waited to see what happened. The Christmas Tree is in the lounge and presents are often placed around it. Would the thread be broken and presents be placed by the tree? If I found broken thread would it be Santa’s doing? Well I have to announce that I found it broken as early as 6.10 am this morning. My son could not possibly have broken it because 6.10 am is an absolute impossibility for him. My mother in law is in her 90th year and is far too clever and mature to think about distorting the truth. My wife never left my bed; I know that because I was awake listening to the World Service on the wireless. The conclusion is obvious and life affirming: it was Santa Claus. Yes I know that Santa has his rivals e.g. parents are known to buy for children, but they merely supplement Santa. Silly of you not to realise that. We are within touching distance of Christmas Day. Although it is a time when friends and family get together to drink and be merry dwindling numbers go to church to worship and there are too many people out on the streets begging, some of them mournfully and some apathetically – thankfully however there are a few with their spirit just about intact. Wherever we find ourselves it is a time to look back. Mining families are good at it. The memory of the orange in the pit sock comes tumbling out with no prompting at all. The box of multi coloured crayons also springs to mind as does, for some, the winter of 1947. That winter is capable of winding Brian M [the mining village poet] up like a clockwork train or soldier, or both; it is a pleasure to read the contributions of that man. I could go on to describe many a fond memory of the past, that is for ever associated with Christmas, but I have already done so in earlier contributions and will not risk boring anyone too much. I can however touch on the idea of reflection. To remember without trying to make sense of it can be self limiting; when nothing is learnt it leaves us in danger of overblown sentimentality. A well respected friend of mine reminded me that lessons can be learnt from reflection, however old one is, and it can lead to better and perhaps less selfish experiences. I could easily descend into rant mode. I don’t need to be on a bar stool after five pints of beer to do that. No, I will not rant, I will be concise; our government brings me despair as well as financial loss despite already being a poor man in relative terms. The Tories are objectionable; too many of them laugh on the back benches at inappropriate times and it reveals an uncaring and unintellectual approach to the electorate as a whole. As for the front bench there really are too many full blown Tories of the worst kind. Chaos is a topical word at the moment so let us hope that when the majority of us experience it we then reminisce, reflect and vote accordingly.